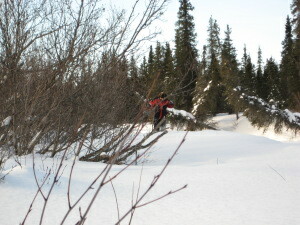 We travelled to Council are to prepare the Boston Creek checkpoint for the All Alaska Sweepstakes. 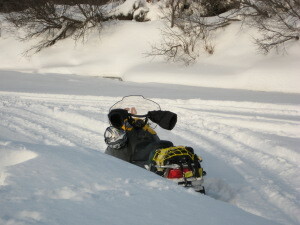 Kenny used his 550 Fan Summit with 136 x 16 x 1.25" track; I used my 300 Fan Tundra with same track. We both pulled 8 ft long toboggan sleds, laden with 400 - 500 pounds each. (Above) Here we are rounding Cape Nome. This picture is taken from the cabin remnants on the back of the Cape, looking east. The tripod markers are visible. Kenny is ahead of me, but the hill has dips and he is concealed on one of them. In the far distance to the left you can see Topkok, a cape later featured in an inbound picture. Location: Cape Nome, Mile 16. (Above) Arriving at the Fish River, we met a group that had a bonfire going. They were there, about 100 yards from the riverbank and Fantasy Island, to watch the annual Nome - Golovin annual snowmachine race. 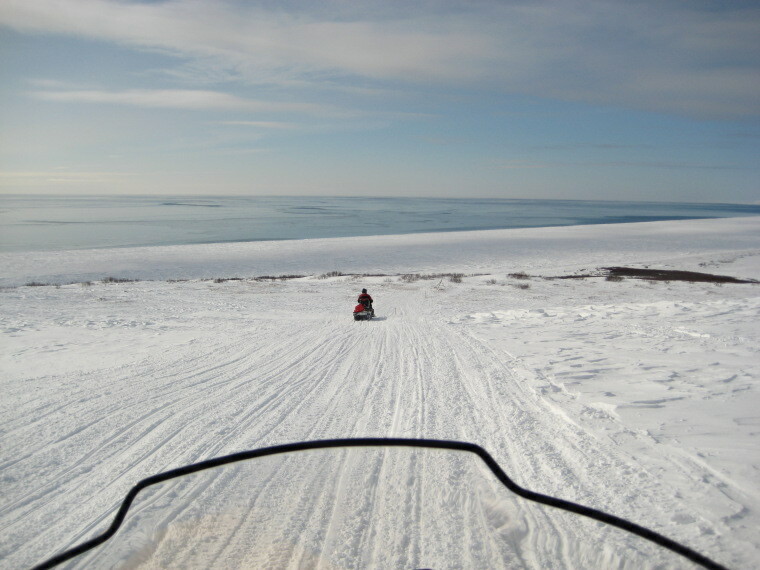 here the racers go by on the way to White Mountain and Golovin. 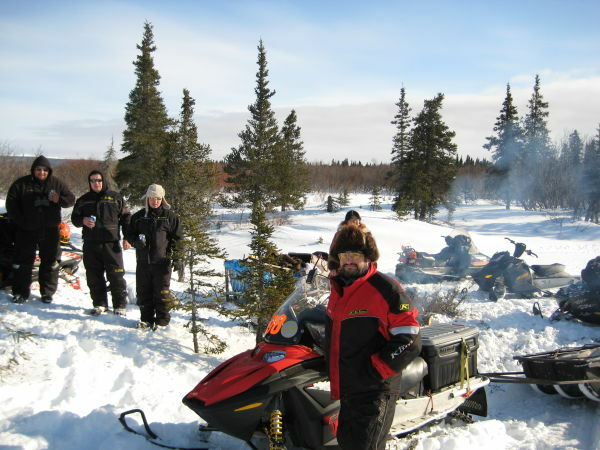 Kenny is in the foreground with his machine and sled. Others in the crowd and their rigs are visible. This is a very pretty place. Location: By Fantasy Island, Fish River, Mile 70. Stage 2: Lost and Stuck! From Fantasy Island we travelled up the Fish River, and turned north at "Johnson's Portage" on what we thought was the trail. Nothing was marked, no tracks visible. We used the gps to assist, and it showed something. We found some markers, and by and by we come to a dead end at the banks of the Fox River. I am sure there is a trail beyond here, but we did not find it. On the banks of the Fox River we got stuck, and we played in the snow for 3 hours. Around 5:30 PM we got out, went back down the Fish River and spent the night in White Mountain. (Above) This is the Fox River. It had some overflow. I got to the bank, sled and all, and not seeing which way to proceed, stopped and was instantly stuck. I had to stomp the area with snowshoes. Kenny came down to help. We uncoupled the sled and we got the machine down the bank to the Fox. 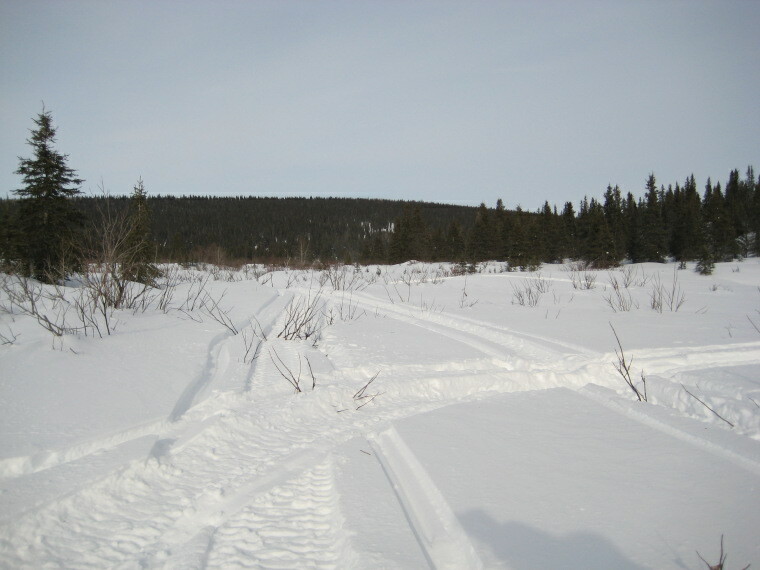 I went back and forth for a distance to pack the trail, but there was a bit of water between the ice and the snow. This picture is of my Tundra packing down snow in the Fox. Location: Fox River, approx Mile 77. 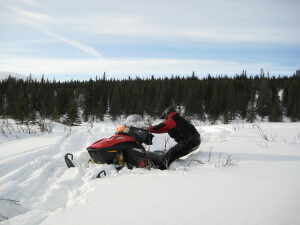 (Above) Kenny had no choice but to come down into the Fox, leaving his sled on the slope. He did not get stuck coming into the Fox, but once there he got stuck getting out. 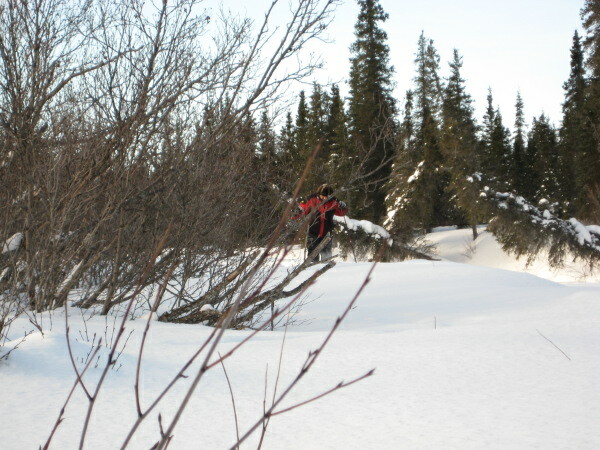 It was his turn to don the snowshoes and stomp a trail on the bank towards where I had been stuck, as this picture shows. Dense trees make this an eerie place. I had no trouble getting out of the creek, and after a while we extricated ourselves and the sleds and went to White Mountain to spend the night. Fresh from a good night sleep in White Mountain, we got us a guide to show us the way. We did not need a guide to get to Council per se, but needed one to show us the All Alaska Sweepstakes official trail, which is different. 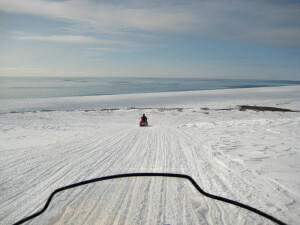 It was about 20 miles from White Mountain and maybe 15 from Fantasy Island. From Council we went up Melsing Creek, up King Mountain, down on Ready Creek, and northeast some other hill where we could see McCarthy's Marsh, Pargon River, Boston Creek and in the far distance, the passes to Death Valley and Camp Haven. 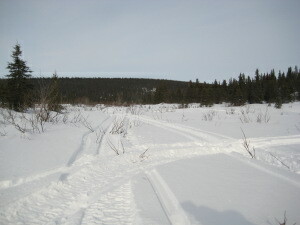 (Above) Melsing Creek. This is one of the original Gold Finds in Alaska, right after the Klondike Gold Rush and before Gold was discovered in Nome. We packed this trail in about 3 to 4 feet of powder snow in Melsing, on the way to King Mountain and beyond. Location: Melsing Creek 8 miles from Council. (Above) Stuck in Melsing. Of course, no traverse would be complete without a little excercise. I took this picture from MY stuck machine, and Kenny got stuck trying to help me. Not his fault, it doesn't count, right? But that's okay, he got stuck later where it counted, but I took no picture. Too much hard work. We shoud have explored farther towards Boston, but like idiots we did not refuel in Council, so we just looked at Boston in the far distance. We spent the night in Council with gracious hosts, Wes and Terrie Perkins and daughter ... and dog Coco. 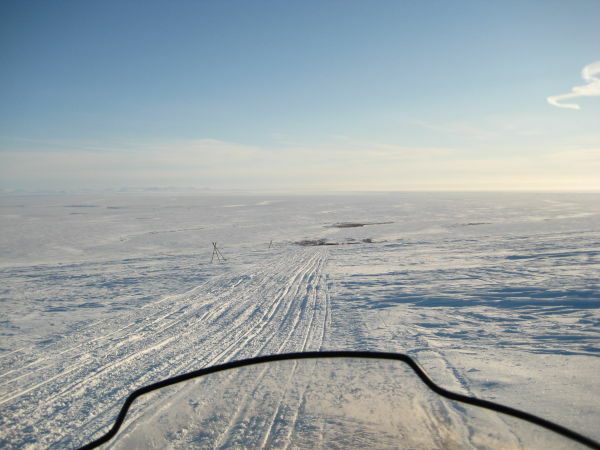 The next day, Monday 3/10/08, we travelled 88 miles to Nome. 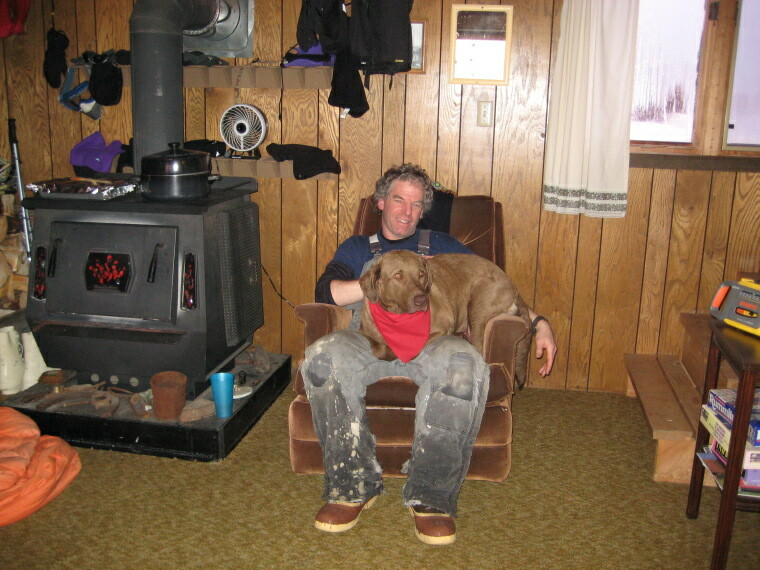 I had some mechanical problems -torn carburator boot- but a field repair got me to Nome in good order. We will try Boston again next week, better organized. (Above) Contended CoCo in Wes' lap. Highly intelligent Chesapeake Bay Retriever female. Come think of it, Wes looks contented too! Location: At Perkins place in Council. (Above) CoCo all dressed for travel. 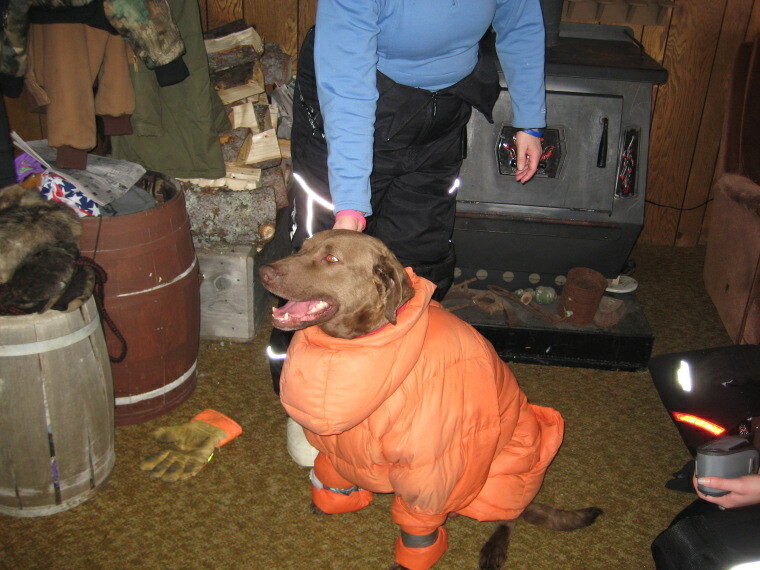 The girls got this dog all trussed up so he would not get cold on the sled trip back to Nome. As you can see, she is all for it! (Above) Coming down Topkok Hill. Below, to the right, just past that willow patc ... if you look hard ... there is a green speck. That is the NKC Cabin at Topkok. That is where Edna Ruud made us the most delicious Salmon Salad Sandwich with homemade bread. Yummy.